The new HDP5000 printer/encoder is Fargo's fastest, most efficient High Definition Printing (HDP) model ever, with improvements at entry level. Simpler operation requires only minimal training. Cards, ribbons and overlaminates now come in cartridges that literally load in a snap. Sharper image quality and new HDP materials deliver more impressive cards at a lower cost per card. And faster printing helps you fly through the biggest production jobs. ID cards should reflect your organization’s pride, and the HDP5000 produces ID cards with the highest image quality available — High Definition cards. High Definition cards deliver the highest image quality —layered on the highest functionality. HDP Film fuses to the surface of proximity and smart cards. It conforms to ridges and indentations formed by embedded electronics, and provides an extra layer of card durability and security. By printing a reverse image on the underside of HDP Film, then fusing the film to the card surface, the HDP5000 creates an image quality that looks more like a crisp glossy photo than an ordinary ID badge. High Definition Printing has big advantages beyond good looks. Printing on film instead of directly on the card means that the uneven surface of technology cards can’t affect image quality, or damage print heads. 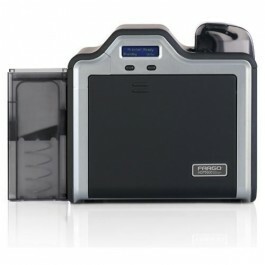 The HDP5000 can print up to the edge of smart chip contacts, and over-the-edge of the card. HDP5000 creates an image quality that looks more like a crisp glossy photo than an ordinary ID badge. Cards produced by High Definition Printing are inherently more durable and secure than other types of cards. They resist wear and tear by putting a durable layer of HDP Film between the card image and the outside world.